What To Do For Those In Peril On The Sea? Tony Slatter provides a personal perspective on the fashion in which criminals are preying on desperate people fleeing wars and poverty. For nearly 20 years I have been a frequent visitor to Malta. I also lived and worked there in the latter part of the 1970s, growing to like both the islands and the people. In a professional capacity I helped the Nationalist Government prepare for its entry into the European Union (EU) in 2004, even though I am deeply sceptical about the EU and its institutions. I took the view that if the Maltese people had decided on EU membership it was their democratic choice. But I also wished to see the island, and especially its people, become a firm member of the Western democracies club and not get sucked into becoming a bridge between Europe and North Africa – and especially not being beholden to Muammar Gaddafi in Libya. I therefore watched with some alarm the growing numbers of illegal immigrants that began to arrive in Malta just as it was negotiating entry into the EU. They arrived on all manner of boats, most, if not all, totally unsafe. There was also a growing number of corpses being washed up ashore, picked up by fishermen or the patrol vessels of the armed forces of Italy and Malta. Once Malta was a EU member state the numbers of illegal immigrants rose each year, with the belief among migrants that landfall in Malta automatically meant access to a life in other EU countries. This did not happen and before long there was a substantial camp housing the illegal immigrants, situated on the former UK naval air station at Hal-Far. The debate within Malta about what to do about this rising tide of immigration dominated numerous articles and discussions in the normal media outlets and latterly has been prominent on social media. Malta mirrored the situation in Italy, France and Spain. Public opinion on the island was also divided between those who watched the rising numbers in horror and those who felt great sympathy for the migrants and their plight. Malta’s appeal for help from the EU received mixed reactions. I think Malta wanted the EU to allow it to let the migrants move on into the wider European Community. Maltese politicians called this “sharing the burden.” Italy seemed to want the same thing but France was very wary of Italian government schemes to grant either citizenship or EU travel documentation of some sort. The ‘Arab Spring’ in Libya, Tunisia and then Egypt during 2011 resulted in more and more illegal immigrants attempting the crossing from Africa to Malta. Four years on, with the collapse of Libya into a post-Gaddafi civil war, turmoil elsewhere in North Africa and the Middle East (including the rise of the ISIL terror group) the flood of refugees from war and economic migrants is becoming a tsunami. In 2004 the European Union formed an agency called Frontex tasked with securing and maintaining the integrity of the borders of the EU’s member states. The headquarters of this agency are in Warsaw. Under the Schengen Agreement the EU has a policy of ‘internal open borders’ but not all member states have signed up, most notably the UK (whose government does not wish to concede such national powers to the EU). Frontex has organised some aid and assistance to states such as Malta so that maritime patrols and air patrols can be undertaken, but it has no patrol vessels of its own or aircraft, other than those it can borrow from EU member states. The Frontex assets are sparse. Its aid has been far from substantial and seems largely ineffective. Patrols have invariably been undertaken much closer to mainland Europe than to the shores of North or North-West Africa from whence the illegal immigrants sail. 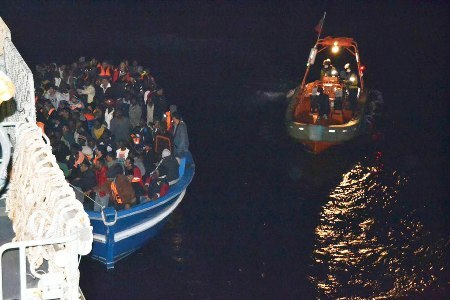 In any event, if the Frontex patrols, or individual patrols of the EU member states, find any vessels, the smugglers have long since left those attempting illegal immigration to their fate. By the time the patrols find the craft they are without crews, generally in an unseaworthy condition, lacking water and provisions and with engines about to die if not dead. The patrol vessels of the EU Member States have no alternative other than to rescue the people in these unseaworthy craft. Many merchant vessels conveniently do not see the craft as, possibly some shipping concerns had no wish to take on responsibility for rescuing people (especially when there is the strong possibility they will find themselves unable to land them anywhere in Europe). The people smugglers are now getting their hands on quite significant small ships of 3,000 to 5,000 tons. These vessels are packed with illegal immigrants paying US $6,000 to $9,000 each for the chance to reach Europe. The smugglers have realised that EU maritime authorities will have to take immediate action to rescue the ships if they are suddenly found to have no competent crews. The tactic of using bigger vessels seems to be successful for the criminals exploiting human misery. The larger vessels now seem to be able to sail with impunity from Turkey and Syria. Frontex and the individual EU member states do not seem to have a coherent idea on how to react to. They are arguing among themselves and the sheer incompetence and failure to agree does not bode well. After all, if developing plans to deal with illegal immigrants is beyond them, the obviously more serious problem of dealing with the EU’s angry and bitter neighbour Mr Putin (or combating terrorism and piracy on the high seas) will be totally beyond the various so-called agencies and responsible authorities of the Union. The writer Auberon Waugh once described the EU as a bunch of overenthusiastic ticket collectors and at the moment one can see quite clearly what he meant. The whole membership of the EU should be asked to commit naval and maritime resources to Frontex at once, irrespective of their responsibilities under the Schengen Agreement. The UK has not exactly been proactive in coming forward with resources but it must surely provide some form of leadership and even assets along with other leading maritime nations, France, Italy, Spain, Greece and Germany. The Italians know what they are about when it comes to tackling the problem as until the end of last year they committed substantial assets to the task. It was really not fair for them to shoulder that burden so they (understandably) stood their operation down and told Frontex to get on with it. All of the EU’s member states have a direct interest in ensuring that if there is to be large-scale immigration it needs to be controlled, organised and not open to abuse by criminal gangs without any grasp of the meaning of humanity. The enlarged Frontex force needs a balance of sea and air maritime assets and an operational command base much closer to the problem than Warsaw. Italy would seem a suitable place. Use should be made of satellite technology as well. Placing a satellite into a suitable orbit that will allow surveillance of an area from Turkey to the Mauritian coast would not go amiss. The European Space Agency has enough technical expertise to put such a satellite into orbit and it would serve more use than trying to send a mission to Mars. There needs to be a force of Maritime Patrol Aircraft (MPA) committed to patrols. Naval forces allocated will require a mix of relatively low cost Offshore Patrol Vessels (OPVs) backed up by more sophisticated warships and auxiliaries capable of deploying a number of helicopters. The national navies would operate the ships but the helicopters could be visitors from the armed forces of various nations. The Italian Islands, Malta and Cyprus could provide forward tactical bases and the Spanish could bury their pride and operate with the UK’s Royal Navy in the Gibraltar and Atlantic patrol areas, East and West of the Straits of Gibraltar and down to (and off) the Canary Islands. The EU must operate its vessels to within 12 miles of the coasts of those nations who do not seem to be able or willing to stop the people smugglers from sailing from their shores. This might require some delicate diplomatic action but after all the EU has a High Representative for Foreign Affairs and this is surely a case where such a person and that office should be pressed into action? Vessels should be turned back before they are in international waters. Presently the Spanish, Maltese and Italians find the ramshackle vessels abandoned on the high seas without crews, food and other basic resources and with poor souls packed miserably into them. The smugglers walk away with the money and the EU member states are left with a cargo of desperate humanity to take care of with all the consequences and expense. One of the larger abandoned smuggling vessels was even found drifting in the lower Adriatic. To the best of my knowledge Iceland is not a member of the EU. However, if Iceland is willing to make such a contribution it does show an understanding of the problem and a willingness to do something not immediately obvious to many politicians and officials in the EU’s member states. It is a European Union problem. It is not a NATO problem and it is not an American or Canadian problem. The USA has enough issues of its own, with illegal immigrants and people exploiting the situation in Central and Southern America the latter making criminal profits out of people smuggling. Action will, if nothing else, give the EU an opportunity show the world that it is capable of something coordinated and significant in the diplomatic and military field. It is also a pressing humanitarian necessity. A Frontex graphic showing the various routes by which people are trafficked into the European Union. Migrants packed into a boat found adrift in the Mediterranean by a European maritime patrol working on behalf of Frontex. Photo: Frontex.